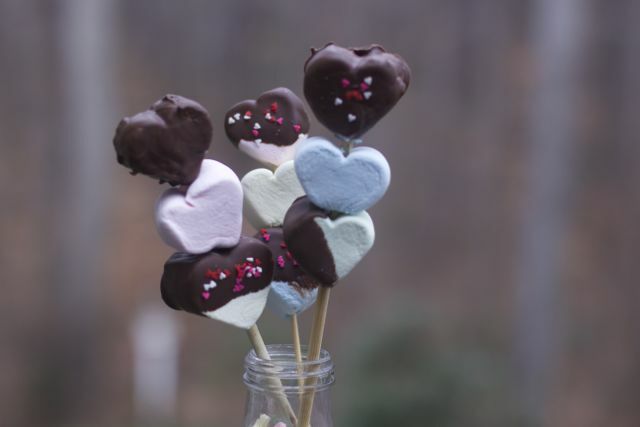 Need easy Valentines Treats for a kids Valentines Party? Then we have the perfect solution for you. 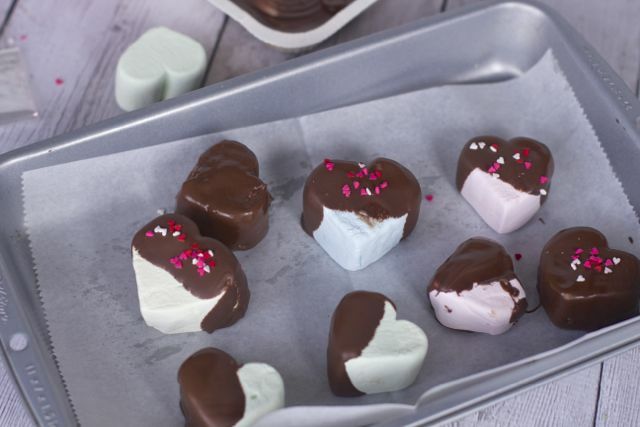 There is nothing better then chocolate covered marshmallowsValentine’s Day is another great holiday to start crafting with food. 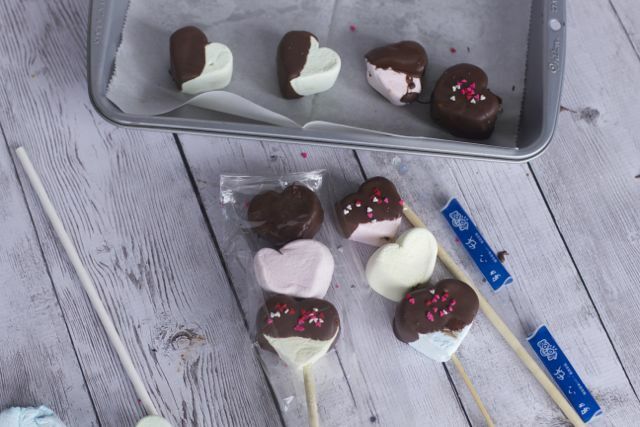 Everything is better dipped in Chocolate this time of year, and marshmallows are no exception. 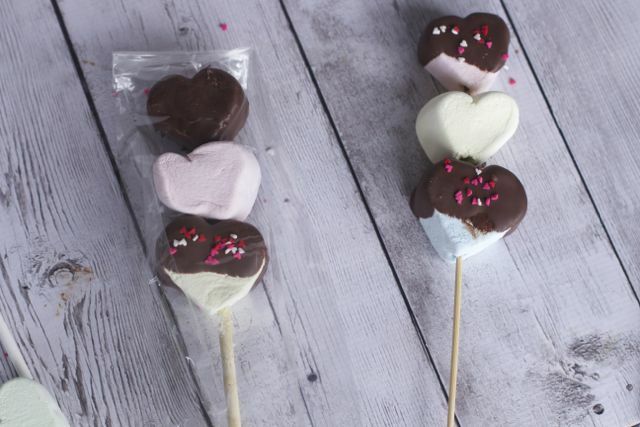 This year we found some large marshmallows at the store and decided to replicate those famous Peep Kebabs and take it up a notch with these Easy Valentines Day Treats: Chocolate Covered Marshmallow Kebabs. 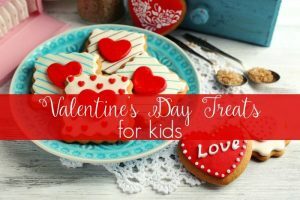 These Easy Valentine Treats will be great for class parties are to give away as Valentines or just eat with the kids. 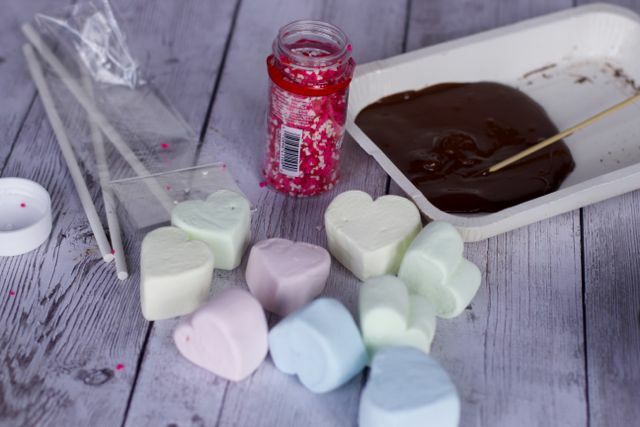 Dip several heart marshmallows into the melted chocolate. I decided to mix things up by covering some partially instead of all completely covered and adding some festive sprinkles. Either way allow them to dry completely on a piece of parchment paper. Using a stick layer the kebabs. We found chopsticks worked well since they have a pointed end and Lollipop sticks sort of crushed the marshmallows. 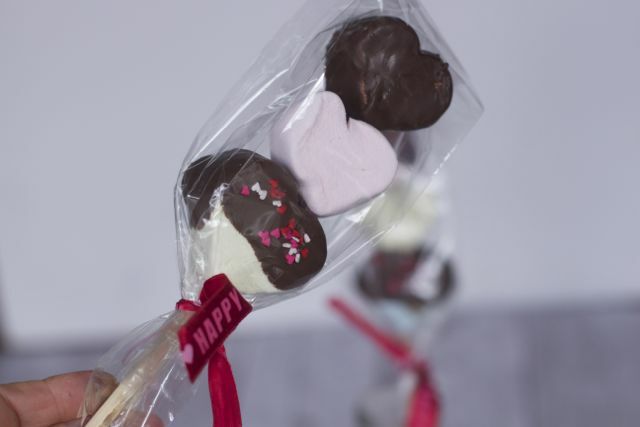 If you plan on giving them as Valentine’s Day Treats or using them in a few days, use Cellobags to cover them to stay fresh. Tie them off with a little ribbon for a special touch. We used Valentine’s Day themed ribbon but any red or pink ribbon will work. 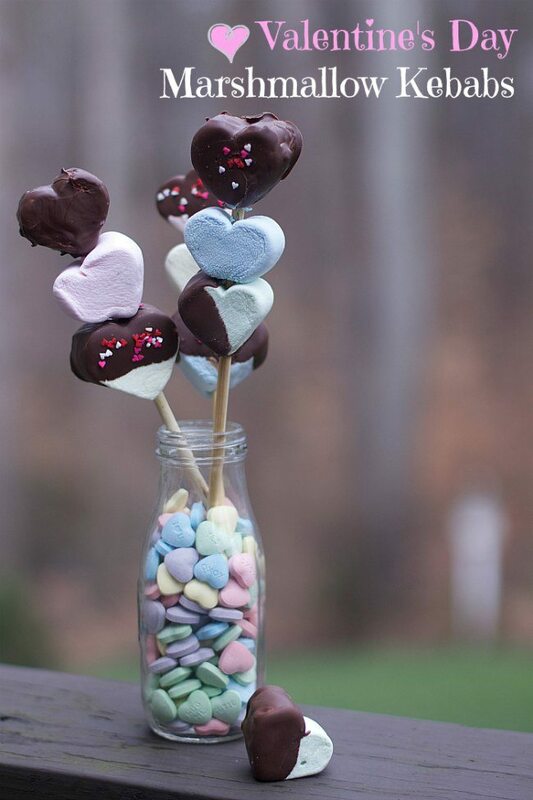 To display our Marshmallow Kebabs, fill a glass jar with Valentine’s Day candy. Stack them in the jar for a great display. They may not fit in your Minions Valentine’s Day Box but they will taste amazing. 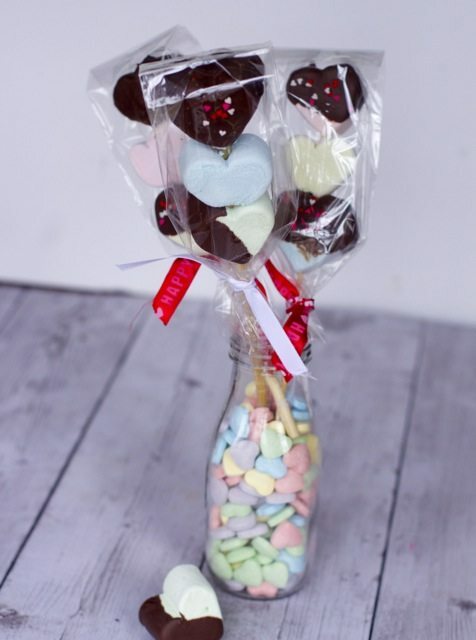 Here they are wrapped individually and will make a great display at your School Valentines Day party. Simple but totally sweet is just what your Valentine will be looking for. 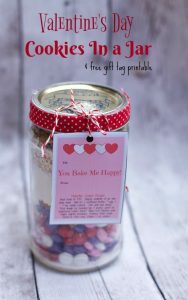 Make these Simple Valentine’s Day Treat in bulk and you can store them in a plastic container to save for later if you don’t want to wrap each of them. its so nice when you have everything you need in your pantry!! The little guy will enjoy making these with me. I think maybe we might share them with the rest of the family. Marshmallow and chocolate, I’m in love! I love making holiday treats for the kids (ok, mostly myself). We will all adore these. I was looking for some easy to do Valentine’s Day activity. I am glad I saw your post. 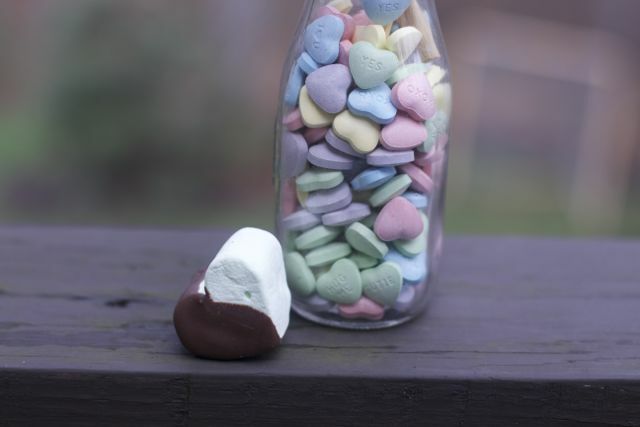 I love this and do have some marshmallow and chocolate bark in my pantry. IF you make them love to see your finished product. I found ours at Target. 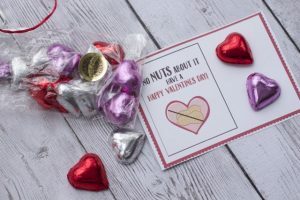 we love easy valentines ideas.. WITh three kids we have no choice. Most kids like them is my guess….. These are so cute! I wish I actually liked marshmallows! Lol. I love cute valentines things like this. what a fun idea! I cant wait to see more the next few weeks! Those are super cute and nice and simple. I haven’t seen heart marshmallows around here recently, will have to keep a look out. These are so cute! Going to have make these for my family. OH, these look fantastic! And easy to do. I’ll definitely be making these–thank you!